Column jackets are effective and economical temperature control for HPLC columns in analytical, preparative, and process sizes. Temperature control from -30°C to 90°C provides improved reproducibility. Use of above ambient temperatures reduces back pressure, improves resolution and increases throughput. For reverse phase chromatography, increased temperature allows a decrease of expensive organic solvents in eluent. The column jackets are used in conjunction with circulating water baths which have high heating and/or cooling capacities. The excellent heat exchange capability of circulating liquids ensures uniform temperature of the columns without hot spots. Use of below ambient temperature improves many chiral separations. 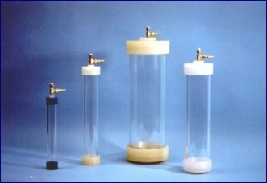 The column jackets are constructed from unbreakable plastic and brass. Five inner diameters are available: 1 1/8, 1.82, 3, 4 and 5 inches in a variety of lengths. We will also fabricate column jackets to your specifications. CJB-KIT Column jacket bodies1 1/8" ID, lengths of 4", 7.5", 10" and 14" and two end assemblies. Make sure that longest cross sectional length of column is less than I.D. of column jacket.